Happy New Year! Bonne Année! Frohes Neues Jahr! Blwyddyn Newydd Dda! You get the gist. It's a brand new shiny year. Full of possibilities. And adventures. And books. And, of course, our reviews. Enjoy! WHITE HEAT is the first of three books in the Edie Kiglatuk mysteries. It received starred reviews and was longlisted for the CWA Gold Dagger Award. Here's the Amazon plot synopsis: Half Inuit and half outsider, Edie Kiglatuk is the best guide in her corner of the Arctic. But as a woman, she gets only grudging respect from her community's Council of Elders. While Edie is leading two tourists on a hunting expedition, one of them is shot and killed. The Council wants to call it an accident, but Edie and police sergeant Derek Palliser suspect otherwise. When the other tourist disappears, Edie sets off into the far reaches of the tundra for answers. Who doesn't love a mystery with a no-nonsense, tradition-bucking, bilingual (Inuktitut/English), Arctic hunting guide protagonist who boils iceberg chips for tea and chews wedges of igunaq (fermented walrus gut)? Not saying Edie doesn't have her demons. She does. She battles alcoholism ("The years of drinking had taken away what pride she might once have had.") and harbors mixed feelings about her ex-husband. But our Edie has ethics and courage in spades. When the elders, who "huddled together like a group of harried musk ox" wanted to ignore a qalunaat's (white man's) death, Edie takes matters into her own hands. As Melanie McGrath, the author researched and wrote THE LONG EXILE, a non-fiction book about Inuit families. So, she definitely knows her stuff! In WHITE HEAT, the Canadian Arctic itself is a character. You practically need to wear a winter coat to read it! I love everything Arctic. Visiting that area is on my bucket list. 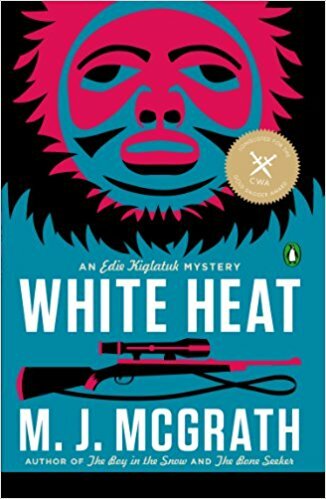 But I do believe anyone who enjoys a well-crafted, well-written mystery set in an exotic locale with a spunky, but flawed, heroine will enjoy WHITE HEAT. This sounds really interesting, Barrie. I have a friend who would love it. This sounds really good! Thanks for hosting! White Heat sounds original! I would appreciate the author's knowledge of native culture. Thanks for hosting!